Serial Acrylic on wood 45 in. x 40 in. x 5 in. Never Comple Acrylic on wood 90 in. diameter x 7 in. Song Acrylic on baltic birch 30 in. x 48 in. x 3 in. Rhythms Acrylic on MDF 90 in. x 55 in. x 8 in. Countdown Acrylic on baltic birch 90 in. x 42 in. 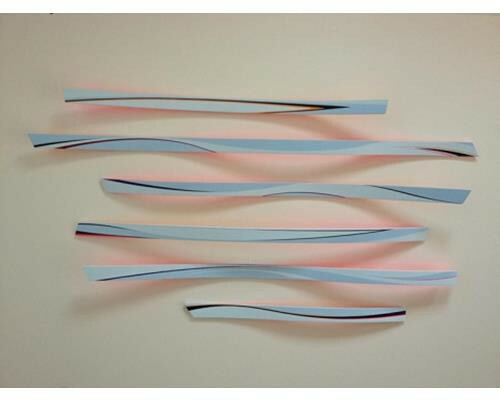 C Suspended Chord Acrylic on baltic birch 90 in. x 42 in. Work In Progress I Kevlar, velvet and acrylic on baltic birch 27 in. x 36 in. x 8 in. While attending Berklee College of Music as a composition major Michael Finnegan became increasingly interested in visual art. Although he was living in Chicago after college he began showing paintings in New York City’s east village gallery the Emerging Collector. 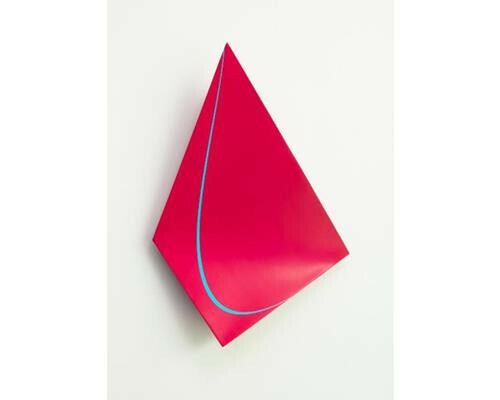 Initially influenced by the work of Francs Bacon his work has evolved into what may currently be seen as hard-edged abstraction. 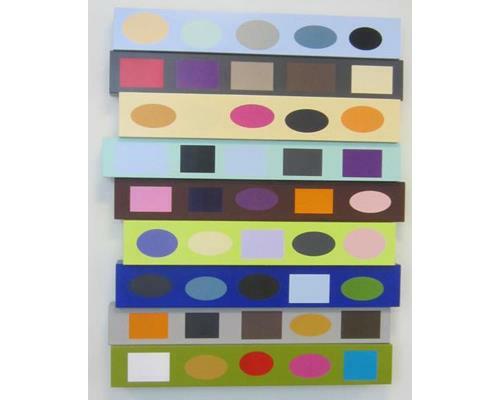 Although the influences of Joseph Albers, Johannes Itten and even Bridget Riley are evident in his work Finnegan isn’t concerned with maintaining a strict tie to any one academic theory or artistic ideology such as minimalism. His work is strongly tied to his deep interest in music. 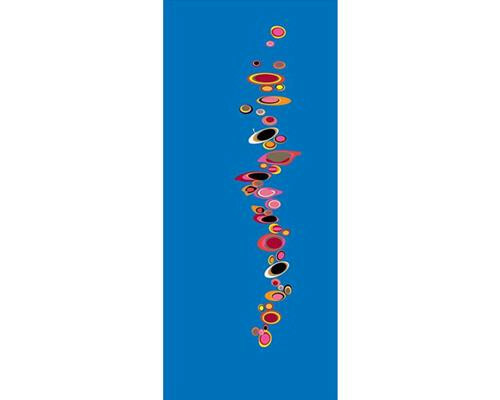 “I sometimes create and compose the visual motifs in my work using concepts borrowed from my understanding of music theory and rhythm” says the nationally exhibited artist. However, Finnegan does not limit himself to just musical influences and draws on other life experiences and intuitive prompts. 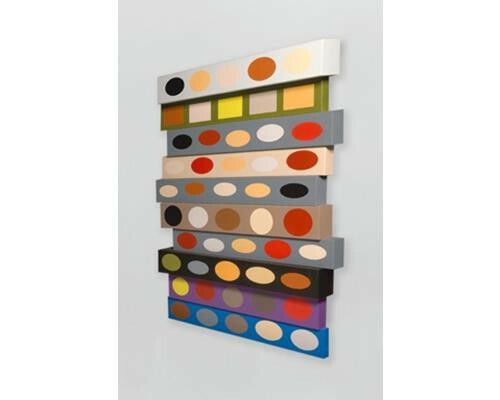 It’s no wonder that waves, water, sound, music, light and color strongly influence his work. He was raised in Hawaii and on the Chesapeake Bay and has lived and worked in Seattle, Washington and on Deer Isle, Maine. 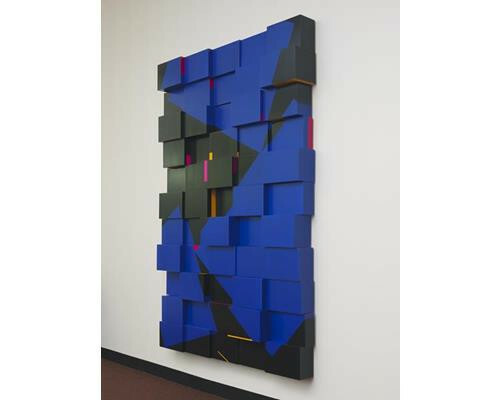 Drawing on his years of experience as a stair builder and finish carpenter Finnegan paints on three dimensional surfaces constructed out of furniture grade plywood and other materials, even Kevlar and velvet. 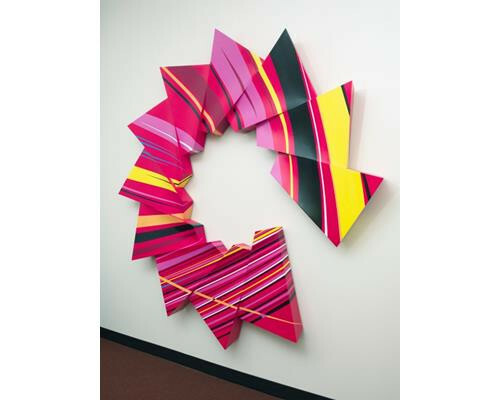 His studio practice includes the use of pencils and a laptop, sable brushes and industrial HVLP spray guns, hand tools and power tools, adhesive vinyl and acrylic paint. Although he majored in Music in college Finnegan feels that creating visual art is the most natural way for him to engage with life. “I work with the belief that the most successful art comes from purposeful study, hard work, and an attention to ones subconscious prompts,” says Finnegan. By creating and sustaining a personal working dialog within his studio Finnegan hopes that the resulting physical statements will directly convey the powerful sensation of life. Finnegan has created large art works in public areas such as the lobby of the Sears Tower and The Olympia Center on Michigan Avenue. He has also created works for private collectors and corporate commissions for such clients as BMO Harris Bank, Neiman Marcus and InSite Real Estate.